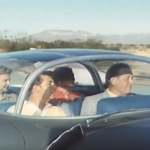 Today’s rediscovery is a vintage car film from the 50s. Yes, me, writing about something car related. I know, strange. But I was recently reminded of this film which I first stumbled upon in the wilds of YouTube several years ago. I thought I had posted it here before, but when I took a spin around SBP I couldn’t find it. So perhaps I didn’t…. shrug. Either way it’s worth a (re)share. 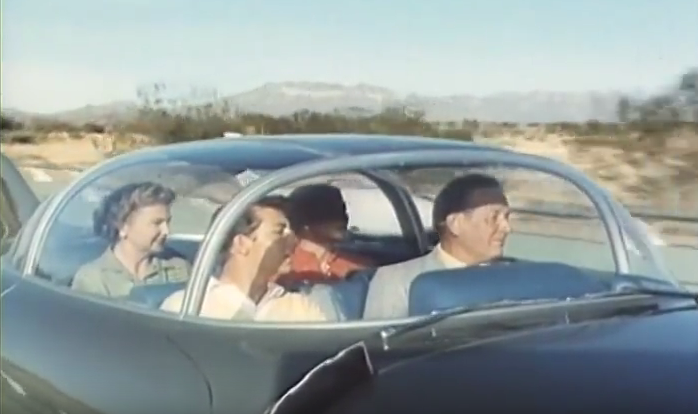 Way back in 1956 when the world was still all shiny and bright, and we were still super excited about our future, GM made a little film for the 1956 Motorama exhibit. ”Key to the Future” was a thrilling and optimistic look at our then far away jet-age future of 1976. In the film we join the perfect 1950s family in their car… mom, pop, and teenage son and daughter. They’re stuck in traffic which causes them to break into a song lamenting how they’re going to be late. 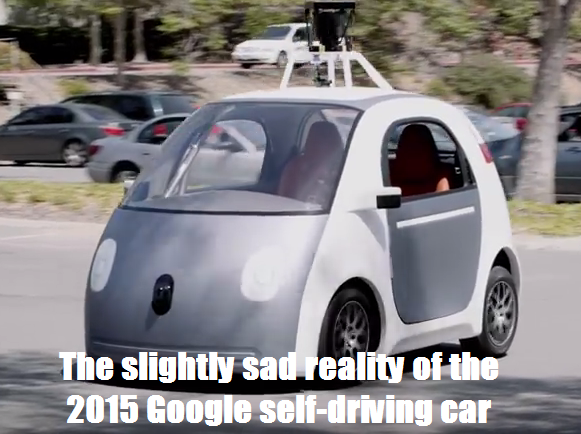 They begin to imagine what things will be like in the future and that’s when we’re introduced to the self-driving car. Yes, GM may have gotten the date wrong. And sure, the details aren’t so spot on. 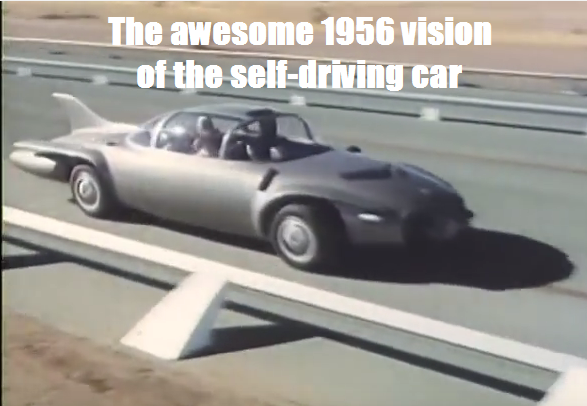 But way back in 1956 they did foresee a future with a self-driving car long before Google was a twinkle in anyone’s eye. And in their futuristic 1976 they even have what looks an awful lot like today’s OnStar. Once they’re on auto pilot and the car is speeding down the high speed safety lane we get introduced to some fun features in the car of the future, like the snack-filled refrigerated glove box. Variations of the word safety get used a lot during the short film, which may offer up a clue to what the folks at GM were thinking about when they made it. By 1956 when the film was made car fatalities had skyrocketed to almost 40,000 (37.965 to be exact by the end of that year). The product that GM was making came with the very real possibility of killing you, so it’s not really a surprise that they imagined a rosy future with self-driving cars where that problem would be virtually eliminated. I look forward to a future where we no longer own individual gas-guzzling planet-ruining vehicles, but rather fleets of self-driving cars pick us up, deliver us to our destination, and then head out to pick up their next passengers. I dream of the time when city parking lots and garages are turned into green spaces and our cities become truly biking and walking friendly. Maybe those folks at GM had a similar dream back in 1956.